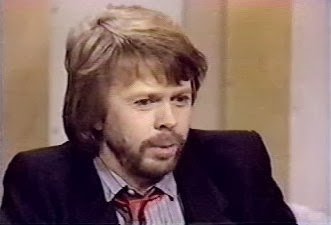 1982-01 Björn and Benny participate in an American television programme called "Let Poland Be Poland". In December, 1981, the Polish regime imposed martial law in order to crush the Solidarity Movement. 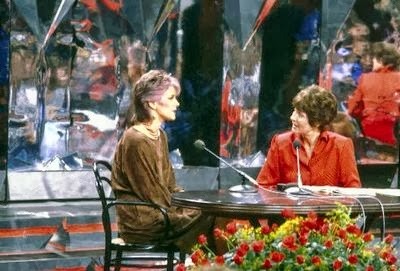 In response, President Reagan initiated a special event called “Let Poland Be Poland,” in which many artists and public figures, including ABBA, took part in. 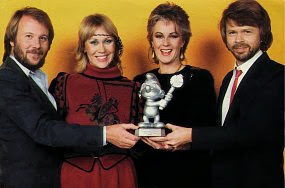 It resulted in the fact that ABBA were banned in the U.S.S.R. "Let Poland Be Poland" was televised in the US without Benny and Björn's contribution. 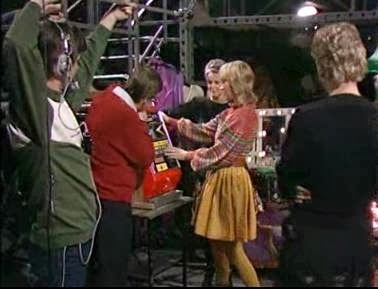 1982-01-21 Filming the promotion clip of 'Head Over Heels' Scenes filmed in the studio and in Stockholm. 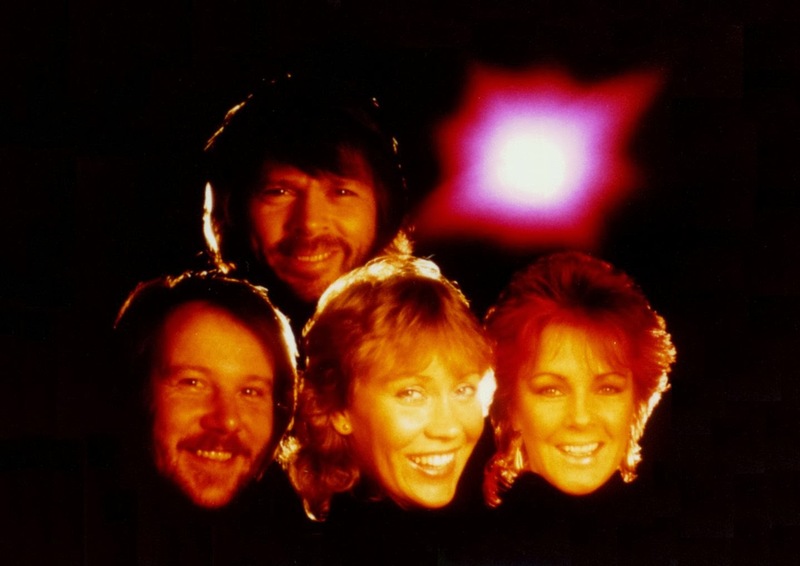 1982-02 This month, a Spanish tv-crew comes to Stockholm to film a part of the Aplauso show with ABBA. The members are interviewed. 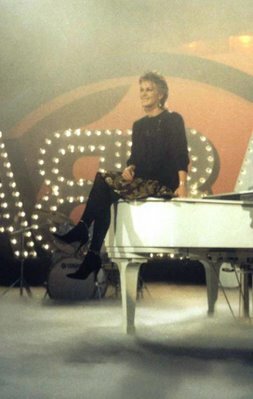 The Spanish version of When All Is Said And Done (No Hay A Quien Culpar) is shown. 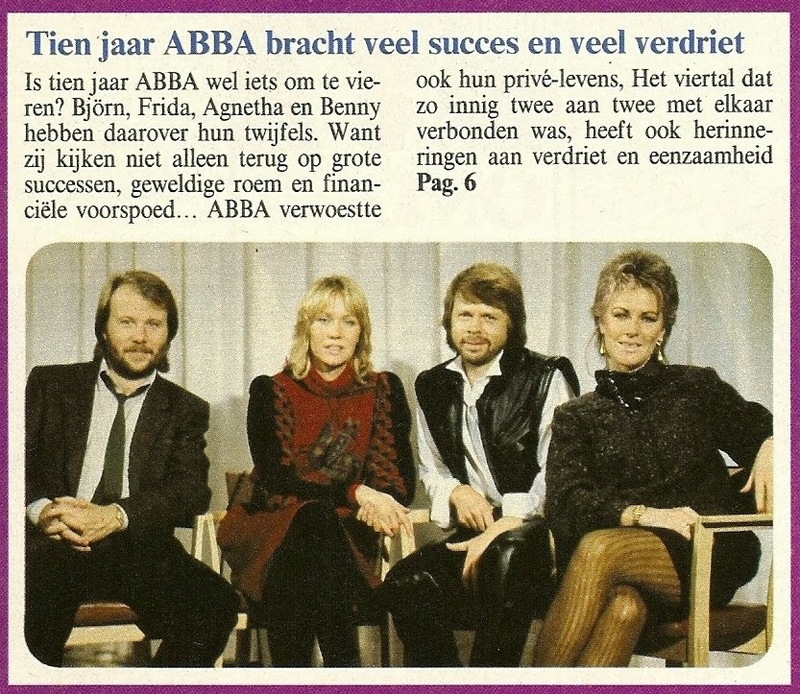 1982-02-11 An article "Where the commerce begin - An epilogue to the ABBA movie", appears in the Russian Pravda. 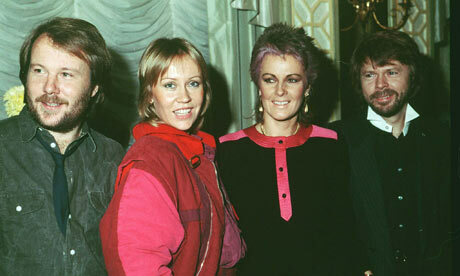 'ABBA - The Movie' is no longer shown at Russian cinemas and the group ABBA is banned during the rest of the 80s. 1982-03-19 Release single 'Head Over Heels' - 'The Visitors'. 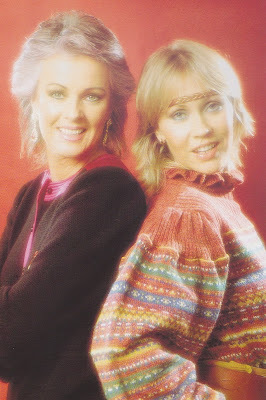 1982-03-30 Photosession for the sleeve of 'The Day Before You Came' single. 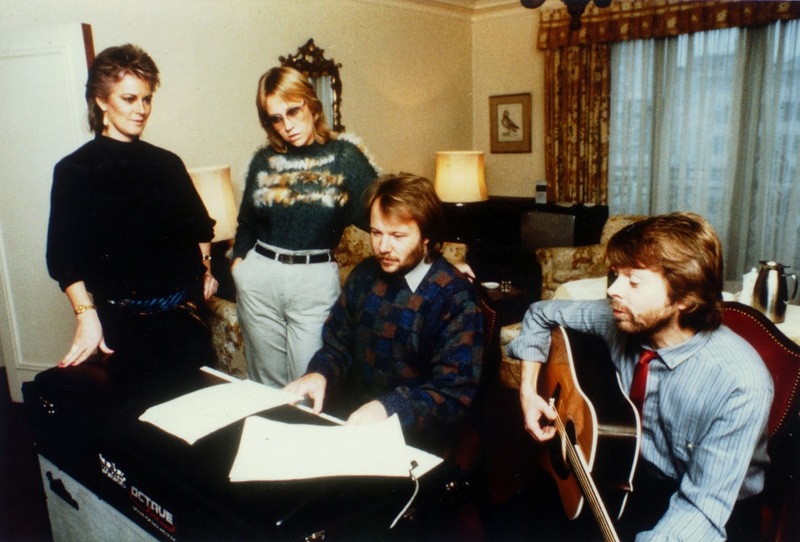 1982-04 Songwriting sessions for 'You Owe Me One', 'I Am The City' and 'Just Like That'. 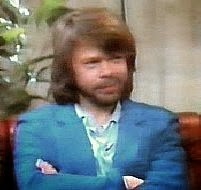 Only 'You Owe Me One' would eventually be released. 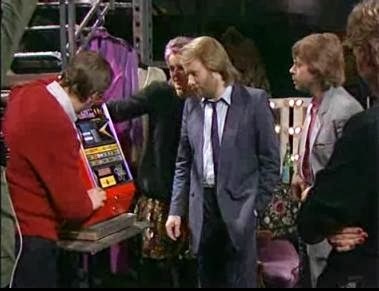 1982-05-03 Backing track of 'Kamelo', a working title of 'You Owe Me One'. 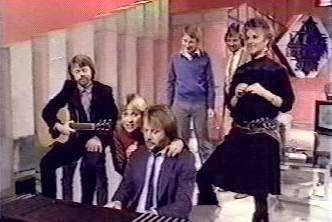 The 'Hovas Vittne' video airs on Swedish television (O.S.A). 1982-05-04 Backing track of 'Just Like That' (first and second mix). 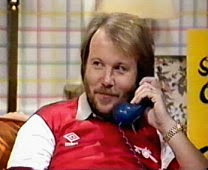 1982-05-05 Backing track of 'Harry' also known as 'Hurry', a working title of 'I Am The City'. 1982-05-06 Further work on 'Harry', also known as 'Hurry', a working title of 'I Am The City'. 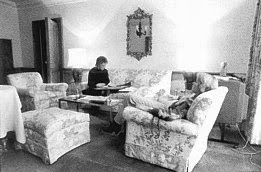 1982-05-08 Work on 'I Am The City'. 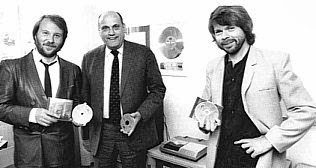 1982-05-28 Two different mixes of the backing track of 'Just Like That' are made today (amongst the la, la mix). 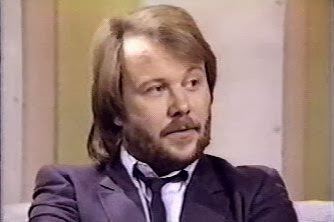 1982-late05 Saxophonist Raphael Ravenscroft (known of his sax solo on Gerry Rafferty's 'Baker Street) plays sax overdubs for 'Just Like That'. 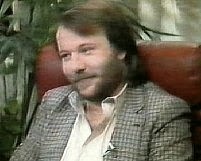 1982-06-02 Mixing 'Just Like That' (Speed up saxophone version) and the final mixing of 'I Am The City'. studio session in August, and we will of course continue to keep you informed of the progress. 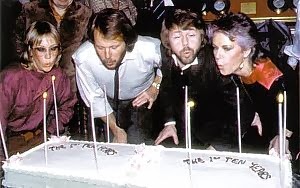 There will, as you understand, not be a brand new ABBA-LP this year, but there will definitely be such a new LP during 1983. 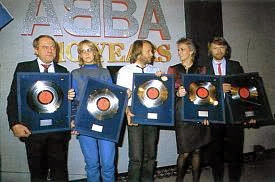 Even if the ABBA members from time to time are doing things on their own, there is no intention whatsoever to break up the group. ABBA have done a 90 minutes radio special with Bob Hamilton of Radio Report, New York. 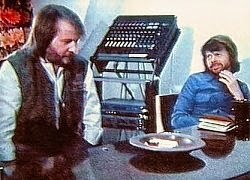 This special, consisting of interviews with all members plus Stig Anderson and lots of music., has been aired all over the U.S. and Canada. 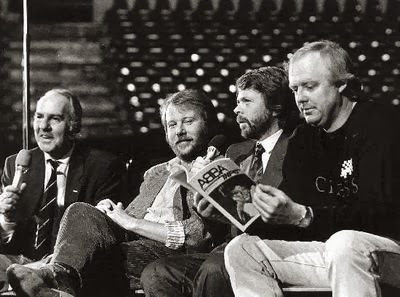 Atlantic Records have also pressed a special LP for this programme as 'give-away' to the listeners, and we have together with Bob Hamilton printed a little book called 'The ABBA Story' also to be given away to listeners. The reaction to this special has been very favourable. 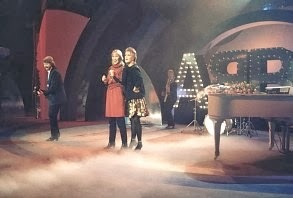 During the same period our TV-special, which was recorded in Sweden last year has been shown in the U.S. It has also been shown in several other countries around the world. 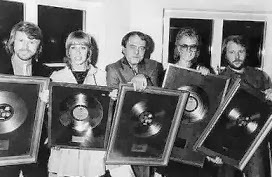 ABBA's latest LP 'The Visitors' continues to sell, and gold and platinum records from all over the world are being handed over to us - from Austria, Portugal, Germany, Holland etc etc. Frida's solo-LP 'Something's Going On' will be released world-wide beginning of September. There will also be a single release' 'I Know There's Something Going On' c/w 'Threnody' a few weeks before the LP. 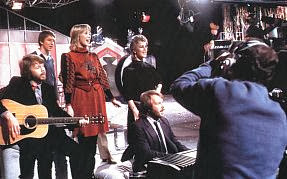 During the recording of this LP in our Polar Music Studios in Stockholm, an English film team did a documentary on Frida and the producer Phil Collins. Included in this documentary will also be one of the two promotions films Frida will be shooting in London beginning of July. She will be filming 'I Know There's Something Going On' and 'I See Red'. 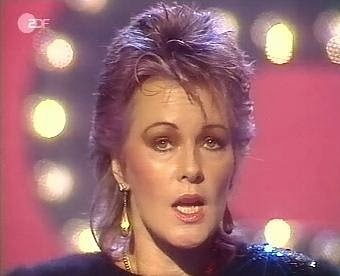 In connection with the release, Frida will do promotion for the LP by going to the U.S., Canada, England, Denmark, Germany, Holland, France and Spain to meet the press, do some TV etc. 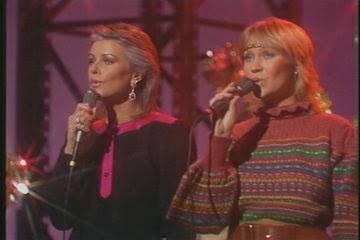 We all believe this is a very exciting LP - and very different from an ABBA-LP! 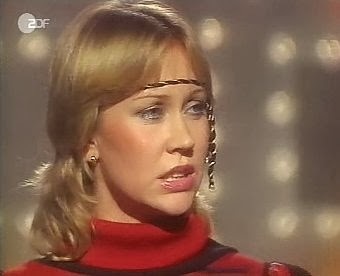 There will also be a solo-LP with Agnetha. 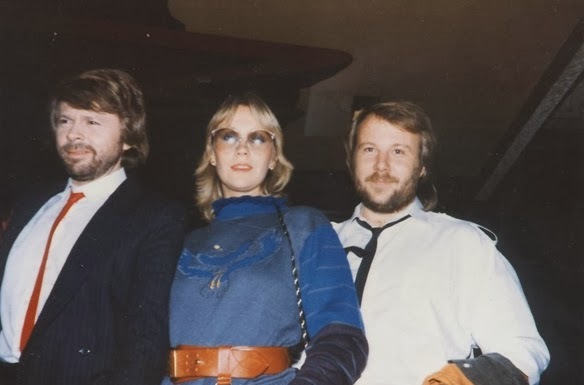 The producer is probably going to be Mike Chapman, but due to ABBA's fully booked schedule, the recording cannot take place until beginning of next year. 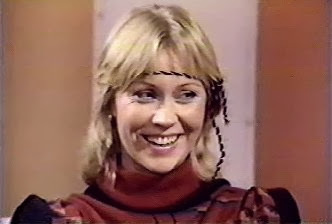 Early autumn Agnetha will also star in a Swedish movie (title not yet known) to be filmed in Stockholm. We wish you all a very nice and sunny summer! 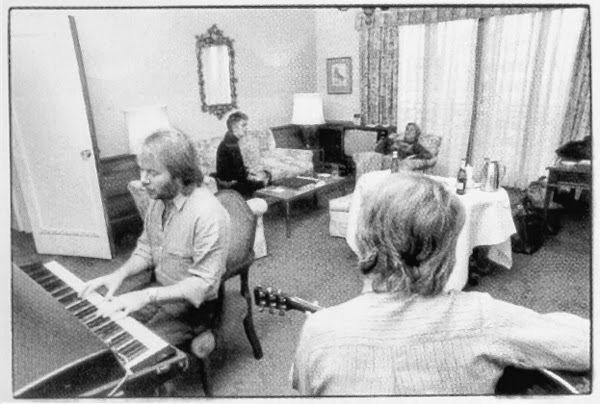 1982late07 Songwriting sessions for 'Cassandra', 'Under Attack' and 'The Day Before You Came'. 1982-08-02 Backing tracks of 'El Paso', a working title of 'Cassandra' and 'Under Attack'. 1982-08-03 Work on 'El Paso', a working title of 'Cassandra' and 'Under Attack'. 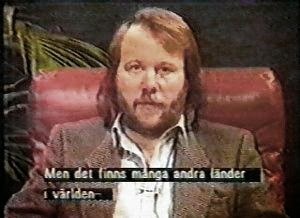 1982-08-04 Recording a 'Cassandra mix with a hard end for television' and 'Under Attack'. 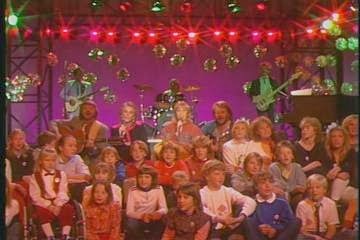 1982-08-20 Backing track of 'Den LIdande Fageln', a working title of 'The Day Before You Came', plus a special tv ending of this track. 1982-08-25 The final mix of 'Cassandra'. 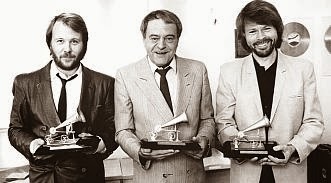 1982-08-26 Two mixes of 'Under Attack' are made today. The last one was eventually released. 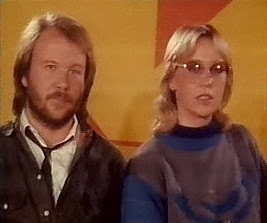 1982-09/10 Promotion film for the Agnetha and Tomas Ledin duet 'Never Again'. 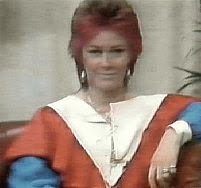 1982-09 Release of Frida's solo-album Something's Going On'. 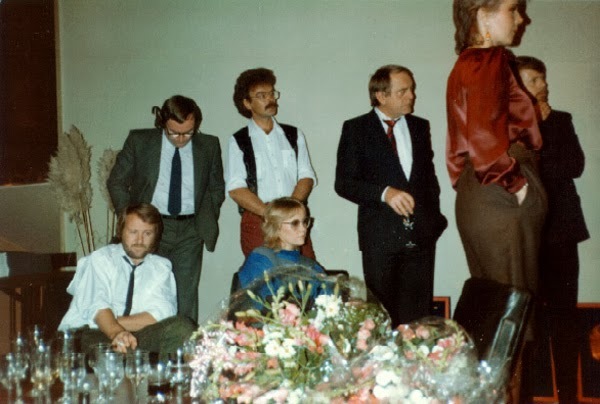 1982-09-07 Frida is in Norway to promote her new album. 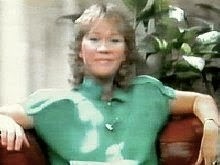 1982-09-09 Frida is on TV Show Show Express in Germany to promote her new album. 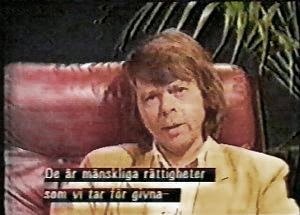 1982-09-21 Filming the promotion clipof 'The Day Before You Came' with actor Jonas Bergström at Tumba railway station, south of Stockholm and in the car park of Arlanda airport. 1982-10-18 Release single 'The Day Before You Came' - 'Cassandra'. 1982-10 Photo session for the sleeve of 'The Singles' compilation. 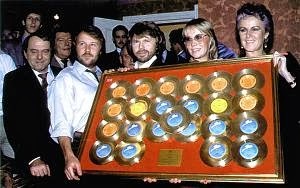 1982-10 ABBA receive the Golden Gramphone from Polydor. 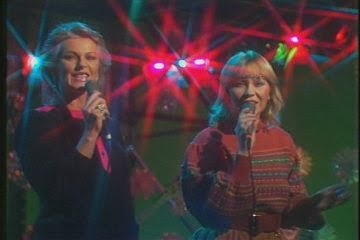 Also presented today is the first ABBA CD:'The Visitors'. 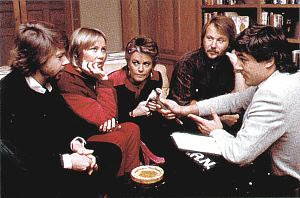 1982-10 ABBA is interviewed in Stockholm by Annette van Trigt for 'The Story Of ABBA' for Veronica (Dutch television). 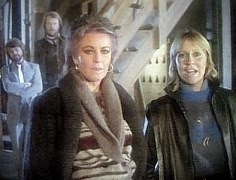 Airdate: 12 December 1982. 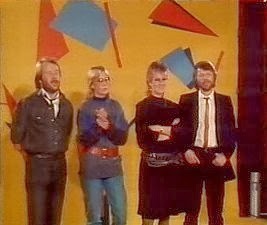 1982-11-01? 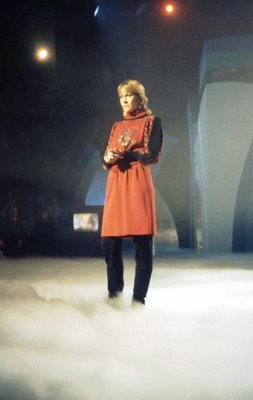 Frida in New York ( Warner Communications Building), promoting 'Something's Going On'. 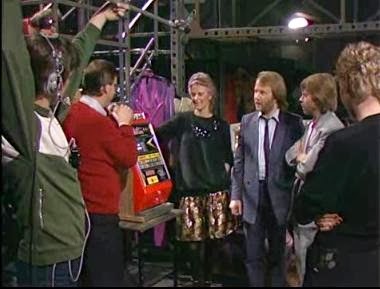 1982-11 Filming 'ABBA In Fick Pengar' (Sweden). 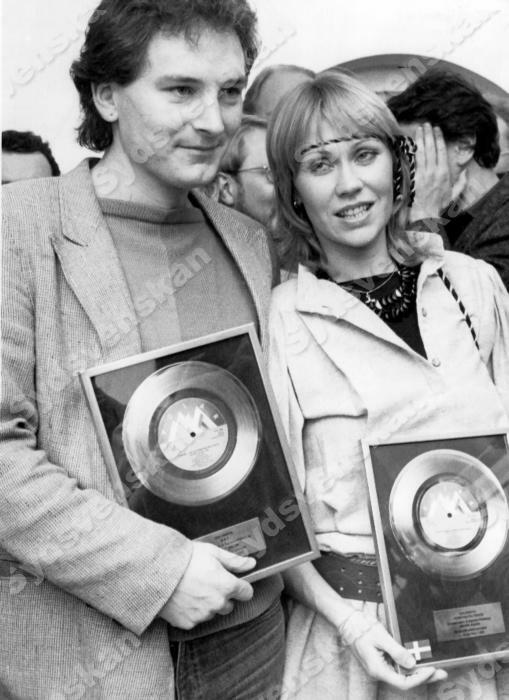 1982-11-03 Promotion visit to London for the LP compilation 'The Singles'. 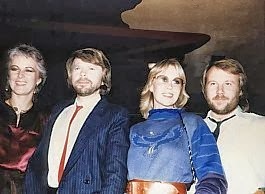 1982-11-05 Press meeting in hotel and later an ABBA 10th anniversary celebration party at 'The Belfri Club' at Knightbridge' in London on this friday night. 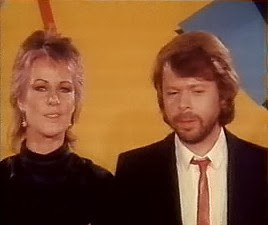 1982-11-06 Benny and Agnetha on'Saturday Superstore' at 11.15 a.m., while the other two were at the Dorchester hotel giving more interviews. 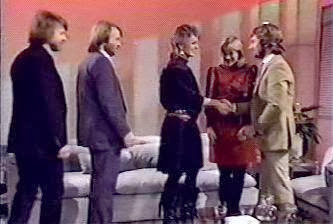 Later that day, at 3.30 p.m., the foursome appear on Noel Edmond's 'Late Late Breakfast Show' for an interview. 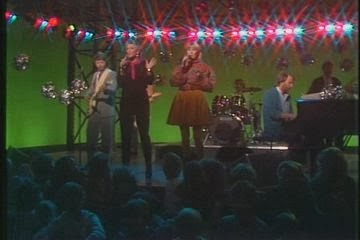 Rehearsals for the Late Late Breakfast Show. 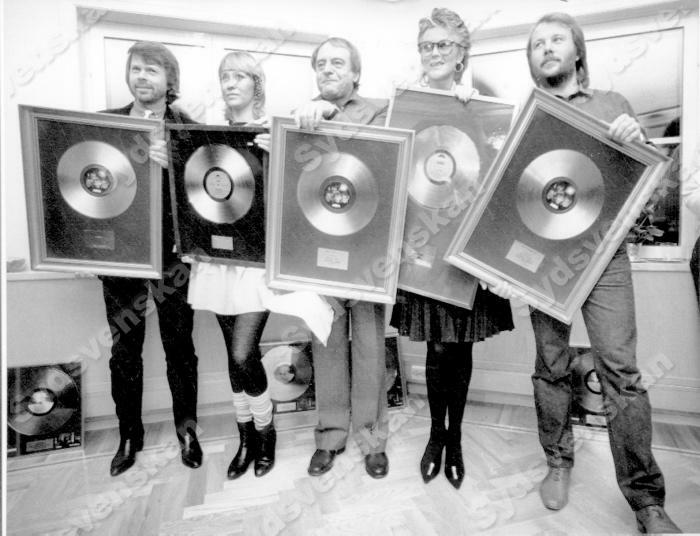 1982-11-07 ABBA fly to Germany for a promotional visit. 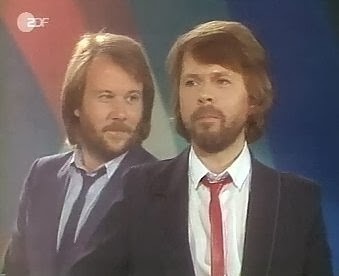 Today they are on 'Tommy's Popshow'. 1982-11-08 Release LP 'The singles - The First Ten Years' today. 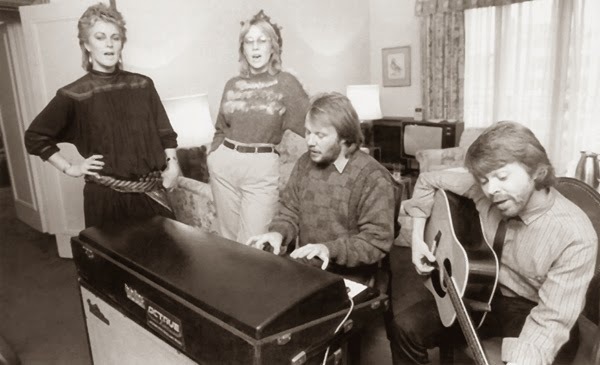 1982-11-10 ABBA still in Germany, rehearsing dresses for 'Show Express'. 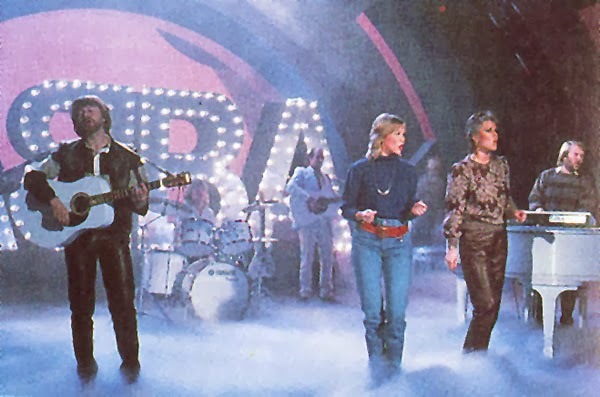 1982-11-11 ABBA in Saarbrucken Germany for the live recording of 'Show Express' They perform 'The Day Before You Came', 'Cassandra' and 'Under Attack', each with different endings than the single releases. 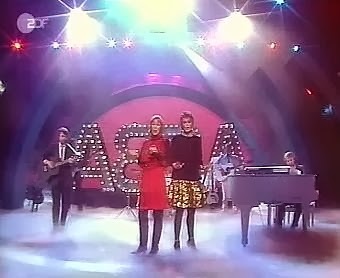 1982-11-19 ABBA on Nojemaskinen performing "Under Attack" and "Thank You For The Music (acoustic). 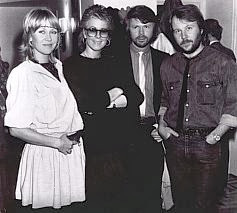 1982-11-20 ABBA at a private reception at the Polar Music Studios. The members are handed a golden disc for 'The Visitors' and the girls are given discs for their solo activities. 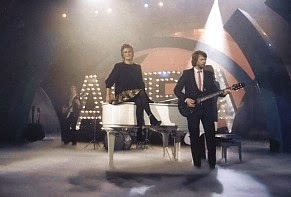 1982-12 Release single 'Under Attack' - 'You Owe Me One'. 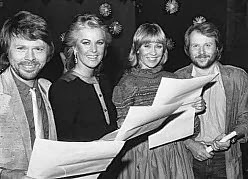 1982-12-11 ABBA via satellite from Stockholm on Noel Edmond's "Late late Breakfast Show" 'Under Attack & 'I Have A Dream'. 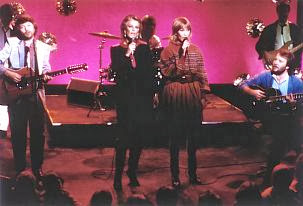 This is considered to be ABBA's last real performance for television. 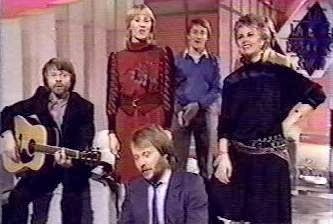 The British 'Late Late Breakfast Show' recorded in a Stockholm studio. 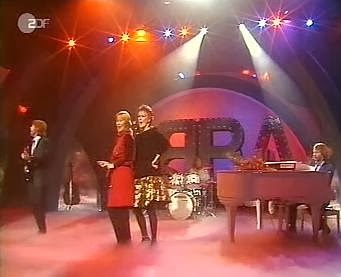 1982-12-23 Frida performs 'You Know What I Mean' on Kanal 3 Swedish television.